August 16, 2017 August 16, 2017 / J.K. Samples has put a book together that looks at Christ and historic Christianity, and compares Him to the leaders or representatives of four other major religions. The book is broken into three parts – a historicity of Christ, both as a man and God; a short intro to representatives of four other religions and how they compare to Christ; a few thoughts on plurality in the world and the Biblical view of other religions. The first part of the book is broken into four sections, but overall it is a basic apologetic for the Christ of traditional Christianity. Samples goes through Christ claims of divinity, the reliability of the Bible, and then a few points on the fact that Christ, the man, a person in history, actually existed. The second part of the book is really the meat and what you’d expect based on the title. It is also broken into four parts and Samples hits on Krishna as representative of Hinduism, Gautama (the Buddha’s birth name) for (obviously) Buddhism, Confucius, and finally Muhammad for Islam. In each section he outlines the life of the person, the basics of their teachings/beliefs, and then how they compare to Christ. The final part of the book is broken into three sections, plurality in our world, Biblical view of other religions, and finally a concluding summary of Christ’s claims verses the other four. I wasn’t really sure how to rate this book. I liked a good bit of it, but found other parts annoying. I guess it will depend on the perspective from which you come to this book. It is a little too apologetics 101 for me, especially the first part of the book. I understand, that almost by definition, if you are trying to substantiate the claims of Christianity, you have to use apologetics, but what bothers me is really more of the tone. There is a just an attitude and style of argument from those in the philosophical (especially Ontological) and presuppositional apologetic framework seem to have. It just rubs me the wrong way. If you like it, or are new to apologetcs, the you will probably really enjoy the first section of the book. All that being said, he does a good job summarizing arguments for the reliability of the Bible and Christ’s claims of divinity that all Christians should know pretty well. The section about the other leaders was a well written introduction. Some of it was new to me and others a good reminder from my high school world religions class. As Christianity declines and more people arrive from different parts of the world, it is becoming more and more important to know the basis of other beliefs. This book could be a good start (Sample pack? sorry) into the study of world religions. He cites other works at the end of each chapter if you want to go deeper. The only part I really didn’t like about the section of the book is that he repeats his arguments (stated in the first part of the book) about Christ again and again in each chapter. Maybe it is a pet peeve of mine, I just dislike redundancy and repetitiveness. The last section of the book was probably my favorite. Sometimes, I’m not sure I’d necessarily call them moments of doubt, I do wonder, what if all paths lead to God? That does change my view that this is the path Christ chose for me, but what if one day we get to heaven and we find out that everyone is there and they all came through different ways? Maybe that would be kind of neat. Samples summary of the issues with plurality point out that this isn’t really possible. For one thing, not all ‘paths’ even have a ‘god’. Many don’t have an afterlife, but reincarnation. Also, what about people who are on no path, so to speak? Even as you try to be kind and loving and accepting (to some extent) of all other beliefs, it is good to remember that plurality (in the sense of all beliefs being equally valid) is unworkable. I think many people could learn something from this book. However, it may not be for everyone. 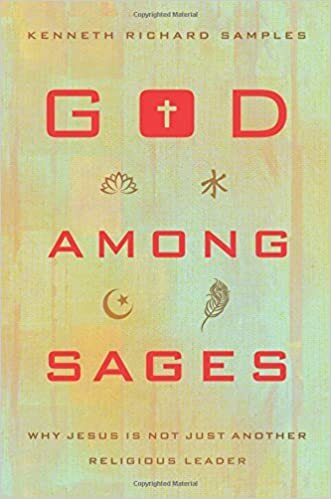 It isn’t quite on the level of everyone should read it, but if you are looking for a good intro to either divinity of Christ, reliability of the Bible, any of the four religions covered, or Christianity in a pluralistic world, then you should put this book on your list.